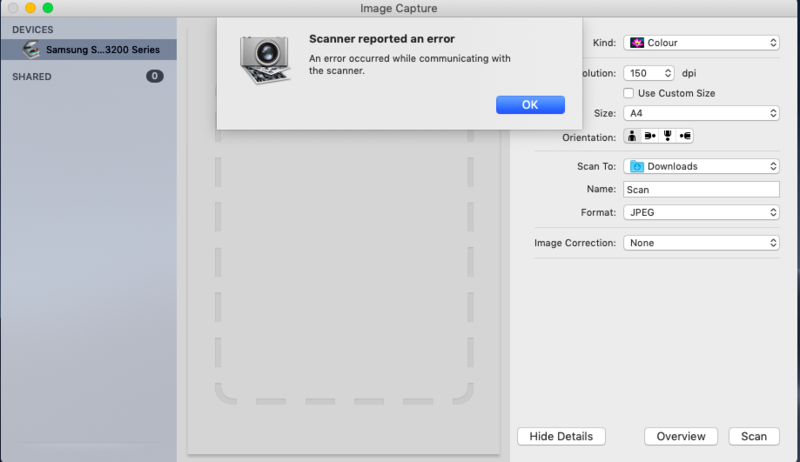 When I try to scan a document using Image Capture, it shows the following error once it's finished scanning. This happens with both JPEG and PNG formats, and regardless of image resolution. However, I can do black and white scans without issues. The issue occurs only on colored scans. I could scan without any issues on another computer (Windows), with the same scanner and the same cable. Browse other questions tagged macos mojave scanning . Is it possible to use Image Capture to scan over WiFi with an EPSON SX620FW, and how to set that up? Is it possible to scan an image from the command line? Can you scan a document directly, instead of an overview scan first?